Toby Summers is a hard man to please. Despite wrapping up the Formula Two 600cc class for a second straight year at the final round of the annual Suzuki Series at Wanganui on Boxing Day, the Manukau plumber still sat in the pits with a frown on his face. A strange demeanour for a double champion. The Yamaha ace was again the top man in the 600cc class at the three-round series, doing enough at the traditional Boxing Day finale on the infamous Cemetery Circuit to complete the job he’d started at the series opener at Hampton Downs at the start of the month and had then enhanced at the second round at Manfeild a week later. But the 41-year-old Summers likes to win races and, after storming to an impressive series win last season, wanted to improve upon that this time around. He did — eventually finishing the 2014 series a healthy 14 points ahead of his nearest challenger, Auckland’s Daniel Mettam (Colemans Suzuki GSX-R600) — but that still wasn’t good enough for the man who is his own harshest critic. 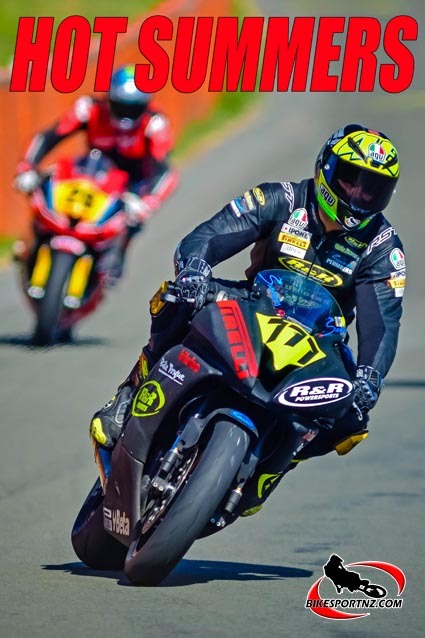 “I won the war but I lost the battle today,” said Summers, who nonetheless qualified second fastest and finished third and second in his two races and ended the day an impressive second overall behind Hawke’s Bay rider Adam Chambers (Wolf Pack Racing Honda CBR600RR). “I got what I went to Wanganui for, the series title outright, and I’m pretty happy with that, but I always want to win. Austrian Horst Saiger (Formula One superbikes); Taumarunui’s Leigh Tidman (F3 Sport bikes); Feilding’s John Oliver (Bears – non-Japanese bikes); Tauranga’s Duncan Hart (Super Moto); Marton’s Jason Hulme (Junior Pre 89 Post Classics); Te Awanga’s Eddie Kattenberg (Senior Pre 89 Post Classics); Waikato’s Aaron Lovell and Tracey Bryan (F1 sidecars).